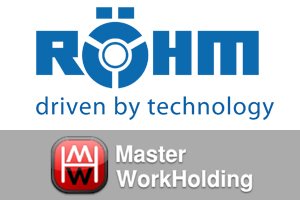 RÖHM Products of America Inc., has announced that it has acquired Master WorkHolding Inc. The acquisition enables RÖHM to combine its 100 years of workholding experience with Master WorkHolding’s 30 years of experience to deliver a truly complete range of standard and custom workholding products and automation solutions for all CNC equipment. Headquartered in Suwanee, Georgia, Röhm Products of America, a division of the RÖHM Group, has been a leading provider of high-quality clamping and gripping technologies to the North American metalworking industry since 1978. The company’s broad and powerful product portfolio encompasses drill chucks, live centers, lathe chucks, vises, automation technology, power chuck technology, mandrels, tool clamping systems, and customized solutions for turning, milling, drilling, and grinding applications. The company also takes pride in providing world-class support and services to ensure trouble-free machining processes for its customers within the aerospace, automotive, energy, engineering, micro technology and rail vehicle manufacturing sectors. Röhm also holds International Traffic in Arms Regulations (ITAR) Registration. For more information, please visit www.rohm-products.com.